Interested in Java, the Raspberry Pi and performance testing? There will be a live-streamed interview from JFokus about our Raspberry Wall on Tuesday. You can participate at NightHacking and chat over Twitter using the #nighthacking tag. This is the presentation for my session at JavaOne 2013, complete with footnotes. At JavaOne I used the small travel wall with 6 Raspberry Pi units. A pity I couldn’t bring the full-scale wall with 48 units, but the small one was also quite popular with the crowd, both at JavaOne and on the streets in San Francisco. Many people and one mascot stopped me and wanted to know more about it. JavaOne 2013 is in full swing and I’m in the middle of it. As usual the days are crammed with sessions with little or no time for anything else (such as lunch – so thanks for the peanuts, OTN!). My favourite Monday session was CON7859 (The Road to Lambda). It provided a good overview of the design underpinning the long awaited lambda language feature due in Java SE 8. The developers have really done a great job, adding the new feature with a natural syntax and without breaking existing code. I didn’t like inner classes when they were introduced, as they made the language more complex, but this time the change feels right. I can hardly wait for the final version to be available from OTN. It was also quite interesting to see BOF7786, demonstrating how to create a supercomputer with Hazelcast, 48 Raspberry Pi units and lego. It overlaps CON4177, which I will present on Thursday, where we are using a wall with 48 Raspberry Pi units for load tests. Many similarities, but also some differences. 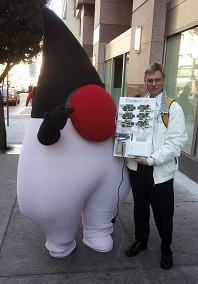 Hope to see you at JavaOne! The latest supported Java version from Oracle for the Rasperry Pi (as of this writing) is Java SE 7 Embedded for Linux/ARM. It requires a license and it supports only the somewhat dated soft-float image. Anyone using it must stick with soft-float for now. Unfortunately recent versions of the Raspberry Pi fail to boot with the soft-float image! We got a batch where some units worked and some failed. Personally I think that a hardware change that breaks compatibility with old software should be branded as a new revision, but with the Raspberry that has not happened. 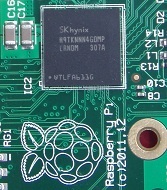 Units that fail to boot have the new square Hynix memory chip in the middle of the board. The label on the chip says Hynix or Samsung. Fortunately there is a workaround. The newer hard-float images work and the Linux kernel in the soft-float image works as well. Copy the three files bootcode.bin, start.elf and fixup.dat from the boot partition of the latest hard-float image to the old soft-float image and the problem is solved. Credits to StackOverflow for the solution. Please note that simply copying start.elf is not enough, all three files are needed. There are several possible Java engines for the Raspberry Pi, but it is not trivial to pick the right one. Oracle’s Java versions are the fastest by far, but they are not free. Oracle Java SE 7 Embedded for Linux/ARM requires a license and it supports only the old soft-float version of Raspbian, not the newer hard-float version. Oracle Java SE 8 Embedded supports hard-float and is the fastest option, but it is still in preview and may not be used in production at all. 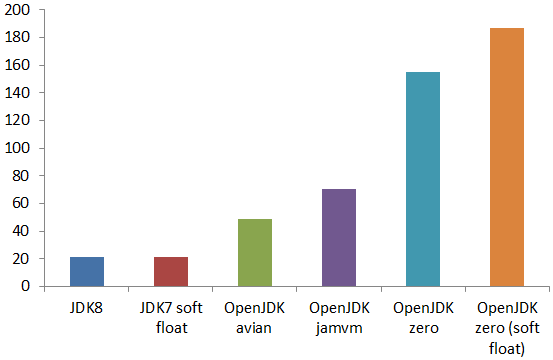 OpenJDK is free, supports hard-float and is easy to install, but it is much slower (see chart). EDIT: With a more realistic and long-running test case Avian ran into problems. This illustrates the problem with micro-benchmarks. Be sure to test with real-world code before making a choice! 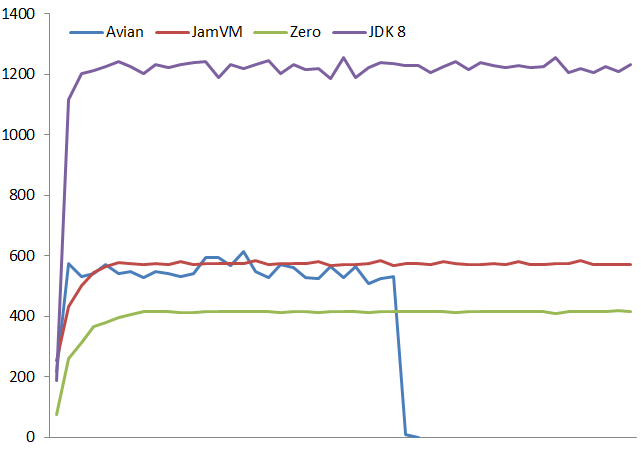 Oracle’s JVM is still the fastest. The test measures the number of business transactions completed per minute.